Are music streaming services the future of DJing? Spotify tracks can now be used in Algoriddim's djay. 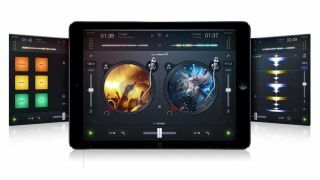 "We strongly believe that music streaming services will play a fundamental role in digital DJing. Not only that, I think music streaming services will elevate the artform of DJing itself, giving DJs a lot more creative input. We've partnered with Spotify to give djay users access to millions of songs instantly." "Mixvibes has always been ahead of trends, from vinyl to CD to MP3. We recently celebrated the rise of the streaming service by integrating SoundCloud on all our platforms: Mac, PC, iOS and Android. But there are still some challenges ahead: network access and legal issues to name just two. Yet we're confident that players in the music industry will soon find a win-win situation. We're at the beginning of an era and Mixvibes is thrilled to be pioneering it." "Streaming is a great format for music discovery and listening, and currently for dabbling with mixing techniques for the beginner DJ. But rights issues prohibit DJs from practicing more innovative mixing techniques such as mixing more than two tracks at once. Also, streaming at 320kpbs through a smartphone or home stereo system may sound fine, but for large club and festival venues, it falls far short of what the dancefloor expects. There needs to be continued innovation, infrastructure for connectivity, and pioneering on rights before it's ready." "As a DJ/producer/moral human, I'm very reluctant to embrace music streaming services because I don't agree with the royalties model they enforce on labels and artists. I genuinely don't think artists have ever been more widely exploited. But, like it or not, I think the last few years prove that anything that makes life more convenient for consumers of music (DJs included) will be quickly embraced. If DJs can reliably stream any track they wantat at least 320kbps MP3 quality, then I can't see them not going for it!" "Many of us depend on the cloud for everything from file sharing to video services. DJs are actively using iCloud for iTunes library access as well as Spotify, which was recently integrated into Algoriddim's djay 2 application. "It's easy to see streaming services becoming a staple for DJs, as the related technology and software evolves to take advantage of expanding high-speed internet availability. Today, our iDJ Pro, Mixdeck Quad and iDJ Live II controllers let you perform with over 20 million Spotify tracks on the djay 2 app. The revolution isn't coming - it's already here."